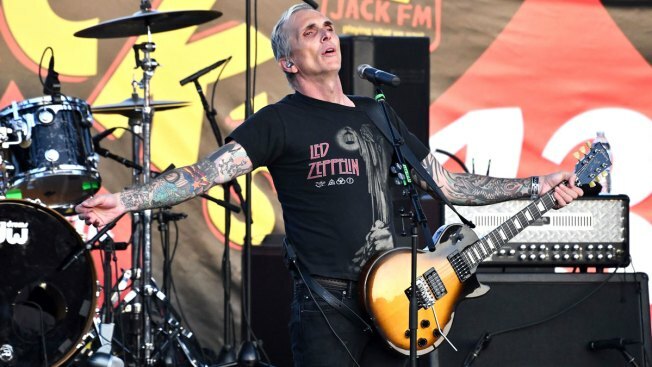 Singer Art Alexakis of the band Everclear performs onstage during the Jack FM 13th annual concert at FivePoint Amphitheatre on October 14, 2018 in Irvine, California. Art Alexakis has multiple sclerosis. The 56-year-old Everclear singer and guitarist shared the news with his fans in an open letter on the band's website. Alexakis opens the letter by recalling an automobile accident he was involved in three years ago. While he totaled his car, he noted "no one involved was seriously hurt." But when he started "feeling a tingle and numbness" in his arm, he thought he had pinched a nerve in his neck and decided to see a doctor. After having an MRI scan, the doctor confirmed he had, in fact, pinched a nerve. However, the medical professional also found lacerations and "suspicious marks" on the spinal cord. As a result, Alexakis visited a neurologist and underwent a "ridiculous number of tests." "After receiving the results, he told me that I have a form of Multiple Sclerosis (RRMS), and that I have had it for anywhere between 10 to 20 years," he wrote in the letter. "I went and sat in my car and called my wife, and cried for about half an hour. I'm sure people in the parking lot thought I was losing it, and I guess I kind of was." Once Alexakis started learning more about multiple sclerosis, he realized that a lot of his past symptoms made sense. "It explains why I have had balance and gait problems for the last 10 years," he wrote. "It helps explain why I have had a higher sensitivity to heat and cold, and why I don't have the energy, vigor, and razor-sharp memory that I had 10 years ago. I thought it was just me getting older." Since receiving the initial diagnosis three years ago, Alexakis has adjusted to multiple sclerosis becoming "another part" of his life. While he claimed he's done "amazing things" over the past few years--like spending time with loved ones, buying a new house and touring with his band--he admitted he can "feel the disease slowly growing in me." "I now have to give myself injections three times a week," he wrote. "My neurologist says as long as I stay on the medication, I should live into my 80's without progression. We shall see." As for his reasoning behind revealing his diagnosis, Alexakis wanted to shutdown rumors claiming he was drinking or taking drugs. He claimed these rumors started to surface after fans saw him looking "unsteady on stage or around town." "So, if you see me stumbling...sweaty, looking both tired and anxious at the same time, maybe a little more confused than usual, or forgetting lyrics yet looking happy (which is weird for me), please know that I have not fallen off the wagon," he wrote. "I am just learning how to be the new me." As for his future plans, Alexakis revealed he's finishing up his first solo album called Sun Songs and embarking on a solo tour called Songs and Stories. He also has plans to write a book. To read his full open letter, visit Everclear's website.